Levant Basin in Eastern Mediterranean. The United States has important national interests at stake in the Eastern Mediterranean. This is the region where the U.S.’ two most serious national security threats converge – ISIS and a revanchist Russia. It is also where two of Washington’s most important allies, Turkey and Israel, once enjoyed a strategic partnership, which may now be rising again after collapsing 5 years ago. Additionally, while four decades of political conflict in Cyprus have aggravated tensions between NATO members Greece and Turkey and obstructed military cooperation between NATO and the EU, Cyprus settlement talks may be approaching a breakthrough. Finally, two of the world’s largest natural gas discoveries in the past 15 years are located in the Eastern Mediterranean: the Leviathan field in Israel and the Zohr field in Egypt. While many observers worry that Turkey’s shooting down of the Russian air force fighter on November 24 threatens to engulf the region in a war between Russia and NATO, in reality, Russia’s response has been restrained. Moscow’s sanctions against Ankara have been relatively mild, while President Putin has never termed Turkey’s action an “act of war,” calling it, instead, a “stab in the back” and a “hostile action.” Futher, despite crude language accusing Ankara of doing Washington’s bidding, President Putin received U.S. Secretary of State Kerry on December 15 in search of cooperation on Syria issues. President Putin knows his case against Turkey is weak. Ankara repeatedly warned Moscow to stop its violations against both Turkish airspace and its bombing of ethnic Turkomen in northern Syria. The Russian President realizes he cannot object too much to Ankara’s claimed right to protect these ethnic Turks who found themselves on the Syrian side of the border after the Ottoman Empire collapsed, lest he risk undermining his own justification for invading eastern Ukraine and annexing Crimea, namely, to protect Ukraine’s Russian minority. Frankly, I am troubled when I observe aparently competent officers who apply the tools of our trade inappropriately in operational situations, or who fail to scrutinize rather basic but critical assumptions underlying our plans, or who substitute program guidance in situations which clearly demand military judgment. The topic of identifying strategic thinkers in the ranks has been a topic of no small interest as the United States emerges from its longest period of combat operations in over a century. One catalyst for the inquiries on strategic thinkers and how to make them has been hindsight from errors of strategy and campaigning in Afghanistan and Iraq. Another has been the difficulties that military leaders experienced attempting to reconcile strategy with the policy goals set out for the military instrument of national power. One observation that emerged from those conflicts is that a singular focus on tactics is simply not enough to achieve more than localized success in engagements and battles. Conflict termination, on the other hand, highlighted the broader role of the military instrument of national power at the strategic level, where success in combat operations is only a transition to establishing a more stable set of conditions after combat nominally ends. Strategists who are trained, educated, and experienced in the competencies of thinking, visualizing, and acting at the strategic level are an important part of the conduct of military strategy in both operational and institutional settings. Those military strategists provide a capability for their organizations and nations that officers trained in tactical methods alone cannot provide. The U.S. Army has formally designated officers by career field for such duties, but those officers do not command organizations as a matter of institutional policy. [ii] Thus, its future commanders will also need development as strategists, even if not to the same degree as their staff officer counterparts. This article offers a framework for preparing commanders and staff officers over a career for duties roles in military strategy and its related disciplines and tasks, using the U.S. Army’s experience as a case study. The efforts to create military strategists have included empowering generalists to conduct strategy duties, and creating a body of general staff officers dedicated to the conduct of strategy and its related disciplines. The literature that has guided those efforts has been largely constant since the mid-1990s. 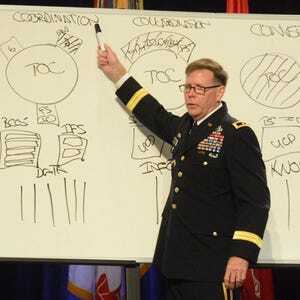 Since the mid-1970s, the U.S. Army has had an additional skill identifier (coded “6Z” in its personnel system) to recognize military officers of any basic branch or specialty who were “qualified for high-level staff positions requiring an understanding of the international environment and the ability to analyze strategic problems.”[iii] Several programs conferred that identifier, but the pressures of maintaining proficiency in traditional military skills in a limited career timeline eroded the expertise that it connoted—making the credential effectively unequal to the task. One of the attempts to address the capability shortfalls of military strategists in public debate remains relevant today. The possibility of a nuclear flashpoint between India and Pakistan appears in virtually every discussion on international relations in the Indian subcontinent. In recent times, the thunder has been stolen by Pakistan’s claim that it has developed tactical nukes to counter India’s conventional force advantage. This has in turn triggered discussions on whether the current Indian nuclear doctrine is credible enough to deter Pakistan. While we try to figure out responses to the nuclear challenge, it would make sense to look at the current levels of India and Pakistan’s nuclear capabilities. The compilation by Hans Kristensen and Robert Norris of the Bulletin of the Atomic Scientists is of great help in this regard. This article visualises and explains the data presented in their articles Pakistani nuclear forces, 2015 andIndian nuclear forces, 2015. The first data point is the amount of fissionable material available with both countries. While Pakistan’s nuclear weapons programme relies largely on highly enriched uranium, India’s nuclear arsenal depends on weapons grade plutonium. This difference in approach is because India opted for a three-stage nuclear fuel cycle, which produces plutonium-239, otherwise naturally absent, as one of the outputs. Though the aggregate fissionable material available with Pakistan looks much larger than that of India, the difference in the number of nuclear weapons is not necessarily proportional, as Figure 2 shows. The current nuclear weapon stockpiles closely match each other. This is because considerably lessplutonium in comparison to uranium, is required to make a simple fission weapon. Compare these numbers with the number of nuclear weapons that US and Russia have — 7100 and 7700 respectively. This comparison immediately clarifies why the word Mutually Assured Destruction (MAD) does not apply to the India—Pakistan conflict. Rather, the deterrence relationship is better explained by the metaphor Mutually Unacceptable Damage (MUD). What is the nature of the nuclear weapons of both states? Capability and intent are two factors that determine the level of deterrence. Capability is further determined by factor such as nature of nuclear warhead delivery systems and the geographical reach of nuclear delivery systems. How do India and Pakistan compare on these fronts? Gravity bombs delivered by air squadrons constitute a large chunk of nuclear weapons delivery systems of both states. Though this method of delivery gives the two states a range of up to 2000 kilometres, the effectiveness is dampened by the fact that ground forces of the adversary can easily target such aircrafts. Land based ballistic missiles are the most preferred delivery system by both states. Pakistan has also nuclear tipped cruise missiles while India’s BrahMos cruise missiles do not have any reported nuclear capabilities. Cruise Missiles suffer from shorter ranges and smaller payloads when compared to their ballistic counterparts. India is also in the process of developing sea based ballistic missile systems. Another factor for assessing the capability of nuclear deterrence is the range of nuclear weapons. Figure 4 shows the classification of nuclear delivery systems according to their ranges. Pakistan having an India focused nuclear deterrence, has not invested in systems with a range greater than 3000km. At the same time, it has invested in short-range, small-yield weapons, which it prefers to market as ‘tactical’ nuclear weapons. India on the other hand has a nuclear deterrence that focuses on both Pakistan and China. Hence, India has invested on delivery systems with ranges higher than 3000km. In summary, the nuclear capabilities of both states have not reached maturity. They are still evolving, though in different directions. India’s perspective has been that any nuclear exchange will result in horrendous consequences to both countries, and the eventuality that Pakistan may suffer much more damage than India will, is no consolation. Considering that any such nuclear exchange will be a big dent in India’s larger growth narrative, it has been India’s approach to keep pushing its nuclear threshold higher. On the other hand, Pakistan is attempting to push its nuclear threshold down through the threat of employing low-yield nuclear weapons. Pranay Kotasthane heads the geostrategy programme at the Takshashila Institution. Weeks after a fidayeen attack on the Pathankot airbase, several key questions are yet to be answered. Among these are: if indeed there was good intelligence, why was the airbase so poorly guarded, and the intelligence not acted upon? How does one explain the gaping holes in the security architecture of a military installation situated so close to the border? Why was there no unified command and control once the attack commenced? Also, when the Indian and Pakistani National Security Advisers (NSAs) met in Bangkok, did they, or did they not, envisage the possibility of a terror attack to try and disrupt the Foreign Secretary-level talks? If they did, what were the contingency plans in place? The biggest question of all, however, is over what Pathankot presages. Is there a message that the Pakistani deep state is sending to the Indian interlocutors? Has the Indian side missed this, or are they still deciphering it? The pattern — first, the announcement of holding talks; next, the collapse of the initiative; and third, renewal of the initiative after an interregnum — has been all too frequent not to realise that there is more to it than mere caprice. Nawaz Sharif’s presence at Prime Minister Narendra Modi’s swearing-in ceremony in May 2014 and subsequent developments were expected to break this cycle. Hopes were dashed when the Foreign Secretary-level talks were called off in August. Between November 2014, when the two Prime Ministers shook hands at the closing ceremony of the SAARC summit in Kathmandu, and their meeting on the sidelines of the Climate Change Conference in Paris a year later in November 2015, there were two ‘false starts’. The latest round commenced with a meeting of the two NSAs in Bangkok. The visit of External Affairs Minister, Sushma Swaraj, to Islamabad followed. The next step was Mr. Modi “dropping in” in Lahore to wish Mr. Sharif on his birthday — all in the same month. Prospects seemed bright, till the Pathankot incident occurred. More than 20,000 independent designers and artists showcase their work on Pinkoi, a Taiwan-based online marketplace. The company has connected with customers in more than 47 countries, using Facebook to expand its reach throughout the Asia–Pacific region. The Estonian start-up coModule has created technology that brings the Internet of Things to electric bikes and scooters. The prototype was unveiled in Barcelona, seed funding came from Germany, and components are sourced in China. The company is scaling up production and eyeing user markets across Europe and Asia. Dr. Chibuzo Anaso has developed an app that helps diabetes patients take charge of their condition. As the product took off in his home market of South Africa, patients in Nigeria and Kenya learned about it through Facebook and Twitter—and today two-thirds of its subscribers come from across the broader African continent and the Middle East. Globalization was once driven almost exclusively by the world’s governments, large multinational corporations, and major financial institutions. But now—thanks to digital platforms with global reach—artisans, entrepreneurs, app developers, freelancers, small businesses, and even individuals can participate directly. New research from the McKinsey Global Institute (MGI) uses novel data to analyze the extent of the connections and their economic impact. The biggest of these online platforms have grown to a scale never before seen (Exhibit 1), and their users are increasingly international. Individuals from Canada to Cameroon can forge their own global connections, whether for business, personal ties, entertainment, education, or simple curiosity about the world beyond their own borders. MGI analysis of international ties on Facebook, Twitter, LinkedIn, and WeChat shows that some 900 million people have at least one international connection on social-media platforms (even adjusting for overlap between their users). More than 12 percent of Facebook friendships are between people living in different countries, and half of active Facebook users have at least one cross-border friend—a threefold increase from 2014. Furthermore, MGI finds that social media plays an increasingly important role in connecting people in emerging economies to the developed world, thereby opening new opportunities for work, learning, and personal connections. The share of Facebook users with cross-border friendships is higher in emerging countries than in developed ones (54 versus 44 percent)—and it is growing rapidly, having posted a 3.6 times increase from 2014. Maoist extremists have brought in units of Company-10, trained to kill with precision; 37 people are known to be on their hit list. Contrary to the Maharashtra government’s recent claim that left-wing extremism is on the wane, the State faces a rejuvenated red cadre that has vowed to eliminate 37 senior police officers and informants in 2016. The latest hit list has been issued by Naxals in response to the State’s lucrative surrender policy, which, the government claims, has taken off in a big way resulting in a substantial drop in violence. But the latest data show that this claim could be exaggerated. Intelligence inputs have revealed that to execute the hit list, the extremists have brought in several units of Company-10 from Chhattisgarh, each with a strength of 30 men trained to kill with precision. “This (the latest hit list) is a matter of serious concern for the State, even as inputs show new strategies are being adopted to attract youth with fresh vigour,” an intelligence note in the possession of The Hindu reads. As part of the Naxal revival policy, documents recovered recently by Gadchiroli Police show that plans are afoot to win the surrendered cadre back to the Maoist fold or eliminate them. The counter-strategy was launched by the CPI-Maoist’s Dandakaranya Special Zonal Committee (DKSZC) in villages around Gadchiroli where most of the surrendered cadre lives. Dandakaranya stretches over 92,000 sq km across five States — Chhattisgarh, Telangana, Maharashtra, Odisha, and Andhra Pradesh. — and is a significant holding area for Maoists. “Left wing extremists adopted a similar strategy in 2009-2010 in Bastar and now, cornered by police action and a spate of surrenders, the outfit is desperate to retain its hold in the red bastion,” reads an intelligence report of the Anti-Naxal Operation Unit of Maharashtra Police. The State government has claimed that thanks to its latest policy – a Rs 5 lakh cash reward and rehabilitation – as many as 51 extremists surrendered in 2015. Violence, too, has ebbed, the government claims. However, there is another side to the story. In 2015, 18 tribal informants were killed, and 15 murders connected to red extremism were reported as against 14 the previous year, 66 policemen injured as opposed to 43 in 2014, 18 civilians were killed as opposed to six the previous year. Naxals also killed 10 police informants in 2015 as opposed to 8 in 2014. Data also show only two extremists were killed in 2015 as against 13 the previous year. Property worth Rs 1.76 crore was destroyed in 2015 as against Rs 1.49 cr the previous year. Two policemen were killed in 2015, while the number was 11 the previous year. This spate of violence and destruction took place despite the government making the Special Director General (Nagpur) accountable for protecting surrendered Maoists under the new surrender policy. Senior officials told The Hindu that a minor drop in violence could be attributed to the joint operations carried out in 2015. Another internal note revealed that surrenders were on account of various factors in addition to the state policy, such as ‘health problems, love affairs, internal rifts, sexual exploitation,’ because of which ‘guns were dropped’. Before the new policy came into effect, 40 extremists had surrendered in 2014, and 48 in 2013, showing there has not been a substantial decrease in either violence or number of persons surrendering since the new policy was introduced in end-2014. Maharashtra first launched a Naxal surrender policy on August 29, 2005, and has claimed that 502 extremists have given up arms in the last 10 years since then in violence-hit regions. “The 2015 scenario indicates that the government’s new approach has ensured a retreat of Maoists and advancement of our forces. But we must move with caution,” a senior official said. Why did we choose this topic? Because things are changing in a fundamental way around us. And they affect our chance to transform India into a modern developed country in which each Indian could achieve their full potential. So I thought I should speak about those changes and how we might respond to them, using them to promote our national interests. Let us first consider the changes that we see around us in our immediate neighbourhood, the Indian sub-continent, then at our extended neighbourhood, east and west, and finally at the world order as a whole. The first decade and a bit of this century were probably thebest decade in the subcontinent’s history in terms of economic growth, democratisation, connectivity and intra-regional cooperation — with one major exception, Pakistan, and, possibly, the Maldives whose future is unclear at present. For all the other countries in the sub-continent from Afghanistan to Myanmar this has been a period of unprecedented and sustained economic growth, of growing connectivity with each other, of settling internal conflicts and democratisation, and of cooperative relations with India. This is true of Sri Lanka (with the end of the civil war, restoration of democratic norms), Nepal, (where the 12 year insurgency ended, Maoists mainstreamed and democracy brought in), Bangladesh (which is coming to a reckoning with its past, fighting extremism, growing faster than ever,and working closely with India), Bhutan (which was ahead of the curve in driving change herself), Afghanistan (compared to an abysmal earlier condition), and Myanmar (where predictions of doom have been belied). This is not to say that all their problems have been solved. Each of us, India included, has major internal political issues and is in need of structural adjustment of their economies to cope with the new global and regional economic situation. But overall, the base has been laid, if we choose to build upon it, to continue progress towards integrating the subcontinent, building connectivity and habits of cooperation and making the institutions we established in this period, like SAFTA, the South Asia University, and others, work much better. The exception, as I said, is Pakistan, not just because she is on the cusp between West and South Asia, and suffers the ailments of both, but as a matter of conscious choice by the Pakistani establishment of the kind of state and society they are building, of their instruments, such as political Islam and jehadi tanzeems and terrorists, and of the calculated use of tension in their relationship with their immediate neighbours, India, Afghanistan and Iran. Pakistan today exhibits many of the same features as are causing turmoil in West Asia — weak state structures, religion in politics and over politics, building nationalism on ancient or manufactured animosities, sectarian violence, an outsized military (in terms of its political role, its claim on national resources, and relative to the real security threats the country faces), a lack of popular participation and belief in the political system, weak economic prospects, and so on. At the same time Pakistan is trying to tap into the economic vitality and consolidation of East Asia, led by China. The China-Pakistan Economic Corridor, from Gwadar port through the Karakoram mountains to Xinjiang is one such an attempt. But it needs the promise of a specially raised division of the Pakistan Army to defend it and those who try to build it. 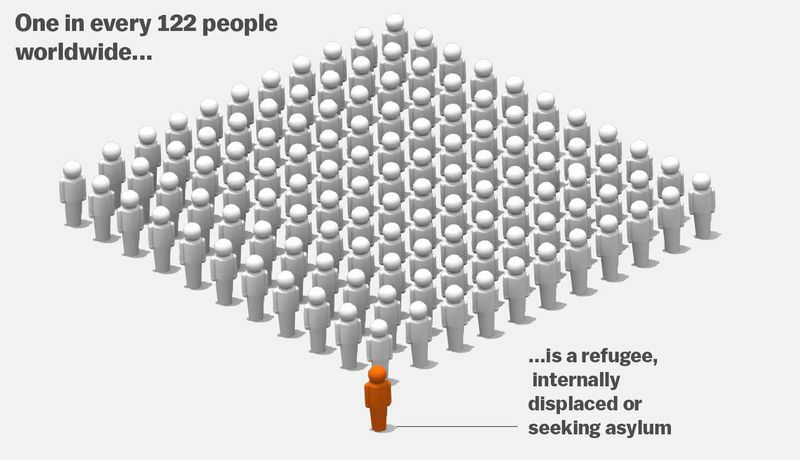 One out of every 122 people alive today is someone who, at some point, was forced to leave his or her home. If you totaled up all these people, they would have a greater population than all of South Africa — nearly as many people who live in all of the United Kingdom. This is the stunning scope of the world's refugee crisis, which the United Nations expects will leave at least 60 million people displaced by the end of 2015. This is the highest level of displacement that the international body has ever recorded. The global refugee total at this time last year was 19.5 million. By mid-2015, it passed 20 million. The world doesn't just have a refugee crisis. It also has a displacement crisis. The refugee crisis has commandeered headlines, especially in the United States, with dozens of governors declaring in November they would not allow Syrian refugees to settle in their states. But the refugee crisis doesn't tell the entire story of displacement. There are even more internally displaced people living in the world right now: those forced out of their homes, but still in their home countries. The ranks of the internally displaced grew by 2 million in 2015, to hit 34 million in the middle of the year. Asylum applications also went up 78 percent. There's no single reason, because a number of the crises driving people from their homes are not connected. There's no real link, for example, between the war in Afghanistan and the persecution of the Rohingya minority in Myanmar, or between violence in Nigeria and violence in Honduras and El Salvador. It has been a disappointing year for the Taliban. I n early 2015 the Taliban undertook a major military effort against the Afghan security forces now that that foreign troops were no longer doing any of the fighting. That role ended in late 2014. As a result the 350,000 personnel of the Afghan security forces (170,000 troops and 180,000 police) have suffered 27 percent more casualties in 2015 compared to 2014. Taliban losses have also been very high, but they have lower recruiting standards and can offer drugs as well as money for those young tribesmen willing to take a chance during the “fighting season” (the annual warm weather period between the time crops are planted and harvested). Going off to try and gain some glory and loot during the fighting season is an ancient tradition in Afghanistan, especially there is not much alternative employment available in the countryside and the Taliban pay well. Being part of an organized army is s different matter. American advisors believe that losing nearly three percent of its strength a year to combat deaths or crippling wounds, as occurred in 2014, is not sustainable. While the Taliban suffer higher losses the Taliban are more flexible in how they operate. This is more in line with the traditional Afghan way of warfare, which is more about raiding and ambushes than it is in operating like soldiers. The army and police are often standing guard in exposed positions (checkpoints or in bases) or obliged to go after fleeing Taliban, who often pause long enough to ambush the troops then move off again. Afghan soldiers and police know they are more effective fighters than the tribal warriors, but that their job requires them to expose themselves to danger regularly in order to maintain control of territory. The Taliban are not tied down nearly as much and that makes a big difference in morale. The drug gangs provide the enormous quantities of the cash the Taliban need to operate as they do. Nearly all the 30,000 or so Taliban are paid and the Taliban leaders are paid much more. Moreover the drug gangs provide enough cash so the Taliban can “compensate” the families of Taliban killed in action. The drug gangs also bribe, and then control lots of government officials (civilian, military and police) and even some tribal leaders. The bribed officials will do things for the Taliban as well as the drug gangs. The Taliban need all the money they can get because their 2015 plan was to eliminate Afghan security forces in the south (mainly Helmand province, where most of the world’s heroin is produced), the east (where most of the Helmand heroin is moved out via Pakistan and the Pakistani port of Karachi to the rest of the world) and parts of the north where heroin is also moved, mainly via Kunduz province to Central Asia. Shitanshu Shekhar Shukla, The author is a senior journalist and columnist. What do you think of India-Afghanistan ties? First of all, I would like to highlight the depth of this relationship, especially strategic partnerships post-liberalisation between the two countries. We have had comprehensive dialogues between the two countries since 2001; however, the people of both countries have an old bond with each other. This bond has helped both the governments to transform that relationship into a more strategic dialogue after 2001 through a strategic partnership agreement in 2011, which included different areas. An understanding had been reached to have a constant dialogue between the countries in the areas of politics, economics, social, finance and security. After 2011, as mentioned in the agreement, subsequent participant council meetings are to be held on different issues, relationships, and activities such as education, science, politics, finance and others. The recent visit of the NSA (National Security Advisor) and the foreign minister was about operationalisation of the agreement. In the agreement, there are provisions where both the countries are bound to get together at a strategic, operational and objective level. At the strategic level, the foreign ministers and head of states are bound to meet from time to time and set working groups to sit further together. In the last two visits, the discussion was aimed at how to operationalise what is committed under the strategic agreement. The deputy foreign minister was here to engage at a foreign secretaries’ level to pave the ground for a dialogue at both the operational and strategic level. The Afghan government will host a participant agreement dialogue. One in Delhi, the other in Kabul. Sushma Swaraj will go to discuss all the issues about the Participative Discussion Agreement. That participative council meeting will set a complete comprehensive agenda for the upcoming visit of the Prime Minister to Kabul. So, we agreed on some steps during the visit of the NSA and deputy foreign minister to set a corrective agenda for both the visits. The last two visits set a roadmap for both the countries to move ahead and we are looking forward towards the two upcoming visits. Since the US and Iran have struck a nuclear deal, Afghanistan is bound to get some benefit from it. Is it possible that India, Iran and Afghanistan can explore some better role during the next South East Asia visit? Absolutely, we are very happy that the tension between the Iran and the US has been mitigated to a greater extent. The more the tension is diffused, the more dividends there will be for Afghanistan and countries around Afghanistan. We are happy that we are promised development on that front. Afghanistan, Iran and India can do a lot for their prosperity, development, peace and well-being mutually, and it can be shared in the entire region. India, Afghanistan and Iran can play their roles better as they have their strategic significance in the region. Afghanistan is, economically, playing a role of connectivity. India is on the edge of South East Asia whereas Iran connects us to central Asia. On the last day of 2015, China overhauled the way its military was structured, creating a new force that's received very little attention in the foreign press. China’s military reforms, which have sped up since Xi Jinping came to power in 2012, are making steady progress and the latest change in the People’s Liberation Army (PLA) was a big one. On December 31, 2015, the Central Military Commission formally overhauled the organizational structure of the PLA, establishing three new organizations: the Army Leading Organ, the Rocket Force, and the Strategic Support Force. The big takeaway: the Third Department of the PLA, the home of China’s cyber operations and commonly known as 3PLA, may be moving to a different command. The Army Leading Organ appears to be a centralized command hub, aiming to coordinate joint operations between different PLA branches, which has long been a goal of China’s military reforms. The Rocket Force, which has been covered extensively elsewhere, is an upgraded version of the PLA’s strategic nuclear missile force, the 2nd Artillery Corps, and seems to be an official recognition of the branch-level role the corps has long played. The new Strategic Support Force (SSF), on the other hand, has gotten scant attention in the foreign press, and is arguably the most interesting development in this round of reforms. In his speech at the founding ceremony, Xi said that “the Strategic Support Force is a new-type combat force to maintain national security and an important growth point of the PLA’s combat capabilities.” Many news outlets have reported that the SSF is focused on cyber operations, but Chinese press reports suggest that the new force has a wider range of responsibilities. A report by an official news outlet compared the SSF to the armed forces of the U.S., Russia, and “other developed countries,” saying that its organization is more advanced, because it involves operations that do not fit well into any existing military force, but touch on all of them. Another report emphasized that it’s “even ahead of the United States conceptually,” which still separates support functions among all the branches of the military so that “they are constantly fighting with each other for resources.” The SSF won’t be on the front lines of combat, but rather provide “information support and safeguards.” However, unlike other support forces such as logistics, it “can use its own power to damage the enemy.” According to the same report, the SSF’s responsibilities will include the “five domains” of intelligence, technical reconnaissance, electronic warfare, cyber offense and defense, and psychological warfare. According to SSF Commander Gao Jin, a lieutenant general with an engineering background and three decades of service in the 2nd Artillery Corps, the SSF aims to help integrate all the other PLA branches and “raise up the ‘information umbrella’ for the whole PLA system.” It will work to integrate “planning, mechanisms, resources, programs, operations, and human resources,” run strategic research projects, and be the “cloud think tank” for the PLA. Chinese reports state that the SSF was created partially as a response to “space combat forces” of other nations, suggesting that this may also be part of its operations. That’s about the extent of what we know right now about the SSF from publicly-available Chinese-language sources. The Russian S-400 TRIUMF (NATO designation SA-21) surface to air missile (SAM) entered the global media spotlight late in 2015 when Moscow deployed the system after Turkey’s shoot-down of a Russian Su-24 FENCER airplane near the Syria border on Thanksgiving Day. The Russian deployment compelled Turkey to pause its air operations and reportedly impacted the execution of U.S. and coalition air operations in the region, demonstrating the considerable reach and influence of this advanced air defense system. This episode demonstrated the S-400’s potential as a weapon with strategic effects, a role that China, the first export recipient of the system, may seek to exploit in future crises. In April 2015, Russia announced the sale of four to six S-400 battalions to China. It remains unclear where China will deploy the assets. However, deployment of the system could influence the regional security order and dramatically impact the ability of the United States and its allies to respond to crises related to Taiwan, the Koreas, and the East and South China Seas. The S-400 is the most dangerous operationally deployed modern long-range SAM in the world. Its maximumeffective range is up to 400km (215 nautical miles). The system reportedly can track 100 airborne targets and engage six of them simultaneously. The S-400 reportedly has the capability to counter low-observable aircraft andprecision-guided munitions, and is also reportedly extremely mobile. The SAM is an excellent example of an anti-access/area-denial (A2/AD) system. The idea of A2/AD is to prevent an opposing force from entering an area and limit an opposing force’s freedom of action in an operational area. As Robert Haddick recently emphasized at War on the Rocks, A2/AD systems pose a unique problem to U.S. power projection and the ability of the U.S. military to maintain its technological edge over adversaries. Yet Russia’s deployment of the S-400 reveals that such systems can have even broader strategic effects. Though not the first SAM to threaten aircraft at hundreds of miles in range — SA-5, deployed since 1966, has a range of 150 nautical miles — the S-400’s capabilities render it far more dangerous than a traditional defense-oriented SAM system. It can engage a wide range of targets, including stealth aircraft and cruise missiles. Its range against aircraft operating at medium or high altitudes is so great that it can threaten aircraft in neighboring countries within their own air space. This capability alone raises the risk of operating such expensive aircraft anywhere near a deployed S-400 system. The Institute for the Study of War (ISW) and the Critical Threats Project (CTP) at the American Enterprise Institute conducted an intensive multi-week planning exercise to frame, design, and evaluate potential courses of action that the United States could pursue to defeat the threat from the Islamic State in Iraq and al Sham (ISIS) and al Qaeda in Iraq and Syria. ISW and CTP will publish the findings of this exercise in multiple reports. The first report examined America’s global grand strategic objectives as they relate to the threat from ISIS and al Qaeda. This second report defines American strategic objectives in Iraq and Syria, identify the minimum necessary conditions for ending the conflicts there, and compare U.S. objectives with those of Iran, Russia, Turkey, and Saudi Arabia in order to understand actual convergences and divergences. The differences mean that the U.S. cannot rely heavily on international partners to achieve its objectives. Subsequent reports will provide a detailed assessment of the situation on the ground in Syria and present the planning group’s evaluation of several courses of action. The U.S. must accomplish four strategic objectives in Iraq and Syria to achieve vital national interests and secure its people: 1) destroy enemy groups; 2) end the communal, sectarian civil wars; 3) set conditions to prevent the reconstitution of enemy groups; and 4) extricate Iraq and Syria from regional and global conflicts. Any American strategy must take urgent measures to strengthen Iraqi Prime Minister Abadi and prepare contingency efforts for his fall. The collapse of the Abadi government and return of his predecessor Nuri al Maliki would be disastrous for the fight against ISIS. Ongoing international negotiations within the Vienna Framework are bypassing essential requirements for long-term success in Syria. Re-establishing a stable, unitary Syrian state that secures American interests requires the U.S. and its partners to 1) destroy ISIS, Jabhat al Nusra, and foreign Salafi-jihadi groups in Syria; 2) identify and strengthen interlocutors representing the Syrian opposition; 3) facilitate a negotiated settlement between the Syrian regime and opposition; 4) obtain regional acceptance of that settlement; 5) establish peace-enforcement mechanisms; and 6) reconstruct state institutions. The Salafi-jihadi militant base in Syria poses a threat to the U.S., but the U.S. must not simply attack it because that would put the U.S. at war with many Sunnis who must be incorporated into a future, post-Assad inclusive government. The U.S. must separate reconcilable from irreconcilable elements. These other Salafi-jihadi groups must meet the following conditions essential for core U.S. security objectives in order to participate: break with Jabhat al Nusra and ISIS; accept the principle of a future pluralistic and unitary Syrian state; reject violent jihad; commit to disarming to a policing and defensive level; and commit to the elimination of the current shari’a court system and the establishment of political institution-based governance. The superficial convergence of Iranian, Russian, Turkish, and Saudi strategic objectives with those of the U.S. on ISIS as a threat masks significant divergences that will undermine U.S. security requirements. Iran and Russia both seek to reduce and eliminate U.S. influence in the Middle East and are not pursuing strategies that will ultimately defeat al Qaeda and ISIS in Syria or Iraq. Turkey’s support for the Muslim Brotherhood and other Islamist groups, some linked to al Qaeda, stem from the ruling party’s intent to reestablish itself as an independent, Muslim, regional power. Finally, Saudi Arabia’s objectives remain shaped by perceived existential threats from Iran and a growing succession crisis, causing key divergences, especially over support to Salafi-jihadi groups. The U.S. must lead efforts to resolve the crisis in Syria and cannot outsource them to partners. The greatest tragedy of the Israeli-Palestinian gridlock, aside from the many lives lost, is that the parameters of any future agreement are already known to all sides involved. These are the common parameters of then-Prime Minister Ehud Barak’s proposal at Camp David II in 2000, the Clinton Parameters of December of that year, and former Prime Minister Ehud Olmert’s initiative in 2008. Broadly speaking, Israel would be required to forfeit the dream of a Greater Israel, to agree to the two-state solution based on the 1967 borders with land swaps, and to accept some Palestinian presence in the Arab neighborhoods of East Jerusalem and in the Holy Basin. The Palestinians would have to agree to an end of conflict and an end of claims, a solution for the Palestinian refugee problem only within the borders of a future Palestinian state (not Israel), and limitations on their sovereignty due to security concerns. Unfortunately, national narratives and aspirations, religious beliefs, perceptions of historic justice, and the practical lessons each side learned in the recent past have all prevented the leaders of both sides from convincing their publics of the need for such concessions—which are necessary for an agreement. Reaching an agreement is harder today than it was in either 2000 or 2008. Even the moderates among the Palestinians are unwilling to concede a right of return, to acknowledge an “end of conflict and end of claims,” to recognize Israel as a Jewish state, or to allow basic security arrangements that will ease Israel’s justified concerns. It appears that in 2016, the Palestinians do not view a two-state solution, along the Clinton Parameters, as a preferred outcome. Instead, their discourse is rooted in a "return of rights" in historic Palestine as a whole (including Israel), in accordance with both the Hamas and Palestine Liberation Organization (PLO) charters. Indeed, the Palestinian positions have not budged much since Camp David II in 2000. Instead, the Palestinians have an attractive (in their view) “Plan B,” which is to get the Israeli concessions in international decisions, without having to make their own concessions—all while denouncing Israel and delegitimizing it in international forums. Since 2008, there are strong indications that the international route was actually the Palestinian "Plan A"—hence their intransigence in entering the talks and in the negotiations themselves. Since followers of the self-proclaimed Islamic State in Iraq and the Levant (ISIL) have launched a succession of attacks in Paris, Sen Bernardino, Indonesia, and elsewhere, we have been inundated with another wave of recommendations on how to fight this group. Distinguished senators and retired generals, along with security and terrorism experts, are saying the United States must commit ground forces into the fray. Senator John McCain “wants 10,000 U.S. ground troops in Syria to crush the Islamic State — and blames President Barack Obama’s lack of leadership and strategy for the “phenomena of ISIS.” McCain, who has some experience at war, wants action now and is of course also seeking political advantage in attacking the current administration. In a recent interview retired Marine General Anthony Zinni also called for immediate action. He repeated the call for 10,000 troops to be deployed. Zinni said, “Limited airstrikes against [Islamic State] targets are not enough,” but “Two brigades would take ISIS out of Iraq in a heartbeat.” According to Zinni: “You cannot control people and ground without ground forces.” Even before Paris there were calls for such action. On November 14, 2014, Max Boot of the Council on Foreign Relations presented Policy Innovation Memorandum 51, “Defeating ISIS.” In this memorandum Boot calls for increasing the size of the U.S. force presently in Kuwait and Iraq, citing estimates of the force size required from 10,000 (General Zinni) to 25,000 (Kim and Fred Kagan). Although committing more troops seems unlikely now (the United States currently has approximately 3500 troops in Iraq and special operations forces in Syria) it is worth delving a bit deeper into the numbers being thrown about. While I did not command above the battalion level and retired as a colonel, I served as a planner for the bulk of my active duty career upon graduation from the School of Advanced Military Studies. In 2002, I arrived at Third U.S. Army for duty as the Deputy Chief of Staff, J5 — the lead planner for the Combined Forces Land Component Command. This command was responsible for developing the plans for and conducting the land invasion of Iraq in 2003. As a part of this job, we were responsible for developing and presenting plans which matched the reality, as we saw it, of the actual situation we would face on the ground during the invasion. From hard-earned experience, I realized pretty quickly that policymakers are enamored by numbers, and when it comes to troop numbers, the smaller the better. Pyongyang's latest nuclear test is another reminder of the seemingly intractable "problem" of North Korea. The country's pursuit of nuclear weapons has apparently been unstoppable. First quietly in the 1980s but lately rather overtly, North Korea has proceeded with its weapons program despite sanctions, isolation, military threats, and attempts at engagement and reconciliation. At a time when the United States is moving toward normalizing relations with Cuba and extolling "historic progress through diplomacy" with Iran, U.S. relations with North Korea are increasingly anachronistic. But Pyongyang's conventional military capability, its often-convoluted relations with its neighbors and the United States, and the ambiguous examples of other states' paths to developing or abandoning nuclear weapons have made "solving" the North Korean problem a complex challenge indeed. Aside from a general agreement on the need for multilateral talks and a desire for a nuclear-free Korean Peninsula, there are few other aspects of North Korean policy on which China, Russia, Japan, South Korea and the United States agree. Within each of these countries, there are strongly conflicting opinions regarding any North Korean policy that limits national, much less international, consensus. Even simply defining the North Korean problem is often difficult. Is it about the pursuit and possible proliferation of weapons of mass destruction? About the security of South Korea in the face of the North's conventional threat? Is it Pyongyang's so-called provocative behavior as a disruptor of regional stability? Is it a question of human rights, global economic access or the legitimacy of the Kim dynasty, or some combination of these issues? Domestic political considerations as much as international security concerns determine various countries' policies toward Pyongyang. And the North Korean leadership is adept at exploiting these internal and international differences. The result is that despite being tiny, constrained by international sanctions and surrounded by some of the largest military powers in the world, North Korea can still manipulate its neighbors' fears and disagreements to preserve its regime by whatever means it sees as necessary to ensure its survival. The European Central Bank sought to calm panic emanating from Italy’s banking sector on Jan. 19. The previous day, six Italian banks – among them UniCredit and Monte dei Paschi di Siena, Italy’s largest and third-largest banks, respectively – announced that the ECB had requested information as part of its review of non-performing loans (NPLs) held by European banks. ECB officials told Reuters the request for information was not an indictment of those banks in particular; they were merely part of a representative sample. But the ECB’s announcement did little to stem negative sentiments in Italy. Italian banking stocks so far are now down more than 17 percent since the beginning of 2016. The banking crisis we forecast for 2016 in Italy is coming to a head. 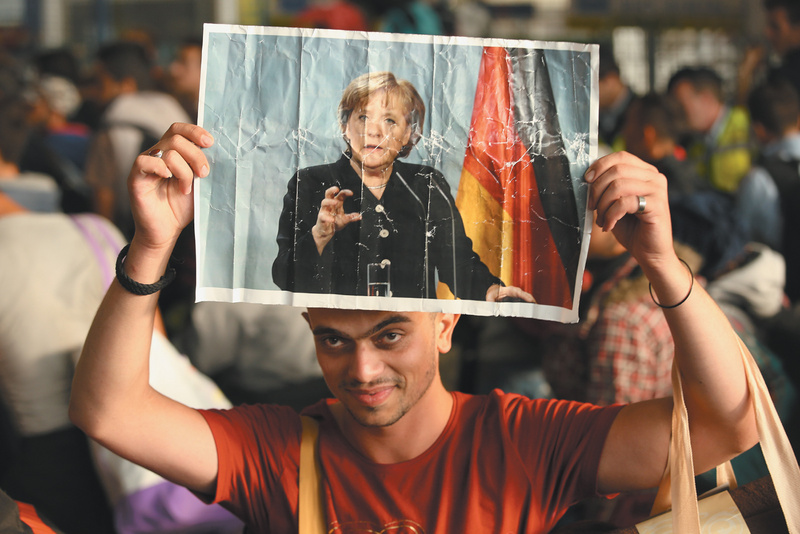 It spells trouble not just for Europe’s fourth largest economy, but also for the European Union and an already sputtering global economy. Unlike the concern sparked in November, when four small Italian banks were bailed out, concern over NPLs is now focused on Italy’s largest banking institutions. In the spotlight today is Monte dei Paschi. Monte dei Paschi has a reputation for being troubled, having been bailed out twice by the Italian government since 2009. According to the European Banking Authority, approximately 17 percent of all Italian loans are non-performing. For Monte dei Paschi, this figure is closer to 22 percent. NPLs and doubtful loans held by the bank total roughly 45 billion euros ($49.2 billion), according to Italy24. For some perspective: the four banks that Italy rescued in December held just 1 percent of Italian bank deposits, and the shareholders affected by their rescue lost about 790 million euros. Monte dei Paschi’s woes are orders of magnitude greater. Italian bank shares fell across the board over the last two days, but Monte dei Paschi has borne the brunt of the negative sentiment. Shares fell 14.4 percent today after tumbling 15 percent on Monday. Monte dei Paschi’s CEO insisted in a statement released Monday that the bank’s health was good and that there was no logical reason for the free fall – a difficult argument to make when you look at the bank’s balance sheet. Italy’s market regulator, Commissione Nazionale per le Società e la Borsa (Consob), took the drastic step of banning the short-selling of Monte dei Paschi shares through Thursday. When China’s regulatory body suspended trading on the stock market two weeks ago as a result of massive plunges, it set off a global crisis of confidence in the Chinese government’s ability to manage its economy. Consob’s suspension of short-selling is not as wide-ranging, but evidently China is not alone when it comes to intervening in a market in an attempt to halt declines. 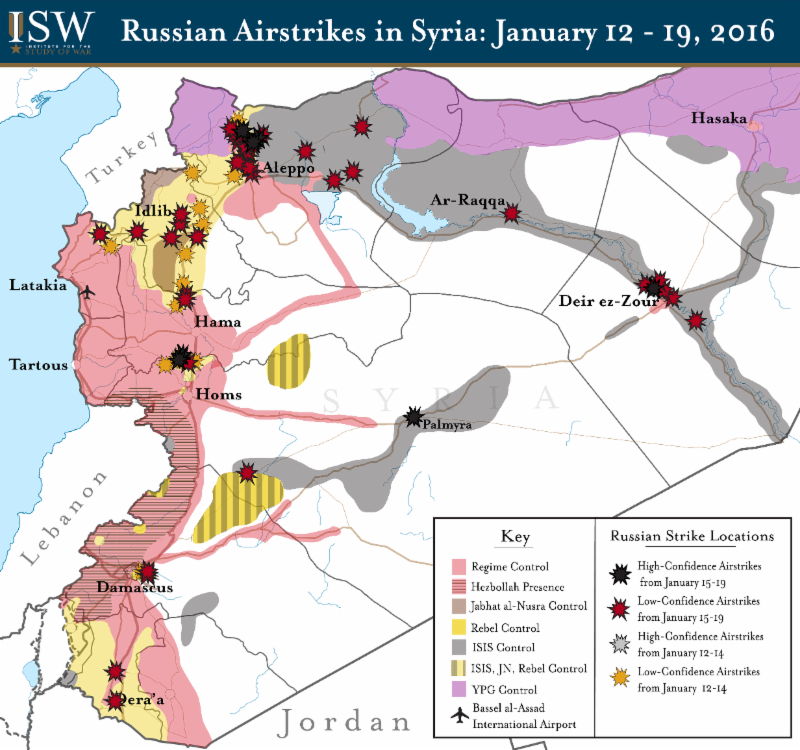 Key Takeaway: Russian air operations shifted eastward on January 18-19, targeting ISIS-held terrain in Homs, ar-Raqqa and Deir ez-Zour Provinces following a major attack on Deir ez-Zour City by ISIS. ISIS launched an offensive against regime positions on the northwestern outskirts of Deir ez-Zour on January 17, seizing two villages and several military installations under the cover of a major sandstorm that reportedly grounded both regime and Russian aircraft. Russian warplanes subsequently shifted operations away from opposition-held terrain in Aleppo, Idlib, Hama, Homs, Damascus, and Dera'a Provinces in order to target ISIS-held positions along the Euphrates River north and south of Deir ez-Zour City on January 18. The shift in Russian air operations serves to forestall the immediate defeat of regime forces in Deir ez-Zour City, one of the last remaining regime outposts in Eastern Syria. Russia previously carried out its first humanitarian aid drop in Syria onJanuary 15, claiming to deliver over 22 tons of humanitarian aid to besieged regime positions in Deir ez-Zour City. The aid operation comes amidst renewed diplomatic pressure by the international community to lift sieges on civilian populations in Syria. Local sources could not confirm whether the aid was humanitarian or military supplies. Is America Ready for a Multipolar World? Washington must be clear-eyed about what comes next. “By 2025, the international system will be a global multipolar one.” That is the forecast of the 2008 volume of the U.S. National Intelligence Council’s Global Trends series—a forecast that still seems correct today. Provocatively, that volume warned that “we cannot rule out a 19th century-like scenario of arms races, territorial expansion, and military rivalries.” At the time, many senior U.S. policymakers dismissed it and other, even earlier, warnings as just another worst-case “guesstimate,” the kind intelligence analysts love to produce. Where the intelligence community can be faulted is in thinking that multipolarity wouldn’t happen as quickly as it did. Hearing many presidential candidates today, it is as if we never left the unipolar moment. The challenge now is to alter our mind-set, which seems trapped in the amber of America’s “exceptionalist” tradition and “indispensable” role. U.S. leadership will have to be honest with the public about the country’s more limited influence and need for strategic restraint. It will take a remarkable and brave president to rightsize America’s goals, in order to reflect our more limited resources and rising competition from China, Russia and other powers. Other great powers—China and Russia, particularly—don’t necessarily share American values, nor do they credit the United States with running a liberal international order. On the contrary, they hold radically different notions about how international relations should be conducted. Chancellor Angela Merkel’s comment regarding Russian President Vladimir Putin’s worldview—he’s “living in another world”—points to the growing gaps with non-Western powers. In the post–Cold War era, the United States got used to being, as the Frenchnoted, “the hyperpower” that made the rules. And for a while in the 1990s, globalization really did appear to mean Westernization, as the number of democracies exploded, China joined the WTO and Russia was invaded by Western consultants telling Moscow how to reform its economy and democratize. Americans can perhaps be forgiven for being irrepressible optimists about the virtues of free-market democracies. But such a universalism of values never existed, and has has fallen by the wayside in the early twenty-first century, in which conflict and extremism—particularly in the Middle East—are on the upswing. Mind-sets, however, rarely evolve as quickly as events. The key is to adapt to new economic and political realities without appearing weak. Now accepting enlisted applications into a year-long, all expenses paid master's degree program in California. 1. Who can apply. The master's degree program is only open to active-duty information system technicians and cryptologic technician-networks on active-duty or Full Time Support. Eligible sailors must also have an accredited bachelor's degree — which isn't an issue for either rating. Over 1,200 sailors in the IT rating have a bachelor's degree in their record. There are also a lot of CTNs who can apply, although it's harder to quantify. There’s 751 E-6 and above in the rating, but the Navy’s data only provides degree data for the combined CT service ratings. Currently, there’s over 10,300 sailors across all nine CT ratings, of which roughly 1,000 have degrees. 2. Cyber sailors. Those accepted will study full-time in a year-long master’s degree program at the Naval Postgraduate School in Monterey, Calif. Since 2012, when the program started, an average of five sailors annually have gotten the nod to earn their Applied Cyber Operations master’s degree. To date, 15 sailors have completed the studies and been awarded the degree. Coursework includes study of cyber operations, from defending U.S. systems to exploiting vulnerabilities in adversaries, alongside mid-career officers. The requirements to apply can be found in NAVADMIN 013/16. 3. Earning your spot. The entry requirements are tough. To apply, sailors must have a bachelor’s of science degree in a technical field that includes computer science; electrical engineering; and information or engineering technology. And you had to do well in those classes. NPS will examine your grades in technical courses. Basically, a minimum overall undergraduate grade point average of 2.2 is required, with at least a “C” in physics and calculus courses. both a calculus for business or social science course as fellas a calculus-based physics course. And it's not just your academic transcripts. You'll also need to submit all of your military training records, including any Sailor/Marine American Council on Education Registry transcripts. 4. Navy requirements. You've got to be more than a great learner to get into this elite program. You can't have any physical fitness failures in the past three years or any evaluation scores below 3.0 in the past five years. You must hold a Top Secret, Sensitive Compartmented Information clearance. (Those without the clearance can apply, but won’t be cut school orders until the clearance if finalized.) And if you're chosen, you'll need to re-enlist for five years before you start at NPS.